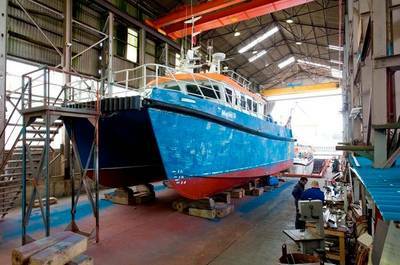 Alicat Workboats, of Great Yarmouth, delivers its latest catamaran workboat 'Dalby Trent' to Dalby Offshore. Continuing the long history of shipbuilding in Great Yarmouth, Alicat Workboats based on Southtown Road and part of the Gardline group, formally hands over its latest aluminium built wind farm support vessel to Dalby Offshore. The Dalby Trent is the third Alicat to be delivered to Dalby Offshore, and Stuart McNiven, its Managing Director watched as his youngest daughter Sophie proudly named it during a ceremony at the East Coast Training Centre at Trinity Quay in Great Yarmouth where it was then blessed by the Rev Peter Paine. He also paid tribute to Steve Thacker and his team and the craftsmanship that went into building each vessel and looked forward to taking charge of the Dalby Trent, which is earmarked for immediate employment.